Amateur Radio Licensing exams will be held Saturday, December 7 at noon at the Oklahoma Fire Academy at 800 N. Portland. This is in the East building, please enter via the South door. This is the reschedule from the cancelled November 23rd session. Please let me know if you plan to attend, but there will be some room for walk-ins, I just don't know if I can guarantee room unless I hear from you. Show 15-30 minutes ahead of the scheduled time to get registered and pay the licensing fee. According to Pete, KE5GGY, the 3.916 Nets will be giving good boys and girls a chance to talk to Santa Claus via the magic of ham radio. The '3916 Santa Nets' will be held on 15 different evenings starting Friday, November 29 through Christmas Eve, December 24th. The Santa Nets are open to all licensed amateur radio operators who wish to invite kids to their shack to talk to Santa. Third party rules will apply. Pete Thomson (KE5GGY), commented on The 3916 Santa Nets. He said, "Christmas is our favorite time of year on The 3916 Nets. Each year on the Santa Nets we are blown away by the response. It's incredible to hear the excitement in kids' voices as they talk to Santa Claus on Ham Radio. Once again this year we'll be having 15 different Santa Nets on 3.916 MHz. This should give everyone a chance to get involved." Thomson added that The Santa Nets are a great way to let kids experience both the magic of Christmas and amateur radio. He said, "We encourage hams to get their kids, grand kids and even neighbor kids into their shacks to participate in the Santa Net. The kids love talking to Santa and we get an opportunity to show a young person how amateur radio works." 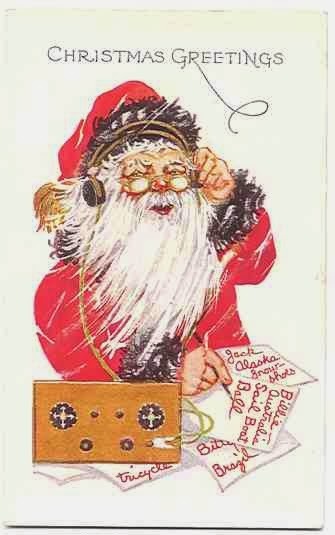 Each evening, The 3916 Santa Net will start at 8:30 PM (Central) on 3.916 MHz. Pre-net check-ins will be taken on the air starting at 8:15 PM. You can also do a pre-net check in by emailing ke5ggy@gmail.com. Does your club offer on the air Santa contacts? Please add those to comments below. Okmulgee County Emergency Management invites Amateur Radio Operators (HAM Radio Operators) to gather at the at the County EOC on Saturday, November 30, 2013 at 10:00 am. Emergency Management recognizes the service and value radio amateurs provide to their communities by assisting in times of need. Several Amateur Radio Operators already lend a hand to emergency management today, serving as storm spotters and emergency communicators. This meeting is in partnership with Amateur Radio Emergency Service-Oklahoma, SKYWARN, and Okmulgee County Emergency Management. HAM Radio Operators interested in helping in times of need are invited to the Okmulgee County Emergency Operation Center at 10:00 am Saturday morning. Coffee and donuts will be served at this brief meeting, which will include a tour of the EOC and the communications room – which is equipped with state of the art amateur radio equipment. Happy Holidays Oklahoma Amateur Radio Operators!! How is everyone in the Oklahoma Section? I hope all of you have had a good year with lots of QSO’s and DX! First thing I’d like to say is a big THANK YOU! To everyone that has expressed well wishes during my recovery from my ankle surgery. Also, another huge THANKS to Eddie Manley, K5EMS and Mary Peelman, KE5LTA and all the other folks that helped out at Ham Holiday and Ada for their work in setting up and manning the league booth while I was laid up. As for the surgery, everything went well. I am presently in a walking boot, after 4 successive casts. I am getting some strength back and relying on the chair a little less every day. The doctor is putting me back in a brace but, one that is not quite as substantial as the previous one. The hardest part will be just building up stamina. I am back to work though. The XYL, Wilma, W5WRO has retired, again and is taking care of the grandson again, so things are hoppin’ around the QTH. The reports I have gotten from this year’s Ham Holiday were very encouraging. I understand Bob Heil was a big hit. I really would have liked to hear him speak at the dinner Friday night. Director, Dr. David Woolweaver, K5RAV and Vice-Director, John Stratton, N5AUS both had an excellent time chatting with all the members that dropped by. The venue also seems to have been well received. Trust me, I would have much rather been with all of you guys than in the hospital. Thanks to Eddie for handling the booth and the forum. I look forward to the 2014 edition of Ham Holiday, Friday and Saturday, July 25 & 26, 2014. 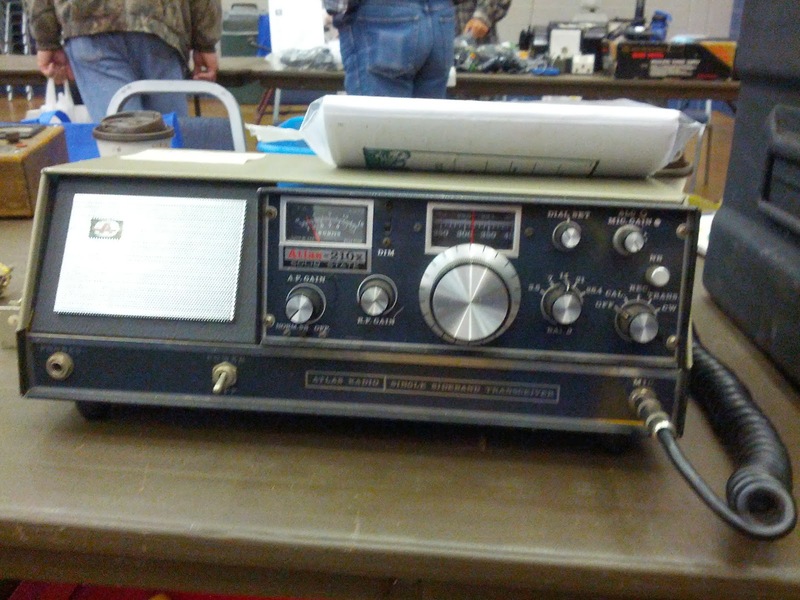 This years Ada hamfest was good, but could have used some more hams in attendance. 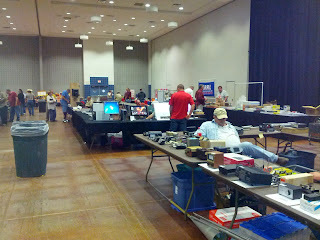 I want to thank all the folks that put in the work to make the hamfest happen. All of us need to support these local hamfests or they will disappear. I know gas is epensive and none of us have as much cash to spend as we used to, but let's try our best to help these folks that work so hard to put on a good show for us. This includes patronizing the commercial vendors. The 2013 edition of Texhoma Hamarama is in the books. This was the first hamfest I got to attend since the surgery. Wilma, W5WRO was gracious to take me to this event and Enid since I still can’t drive. The event was VERY well attended with lots of gear, both new and used, walking out the door (hopefully paid for). This was probably the largest crowd that stayed through the drawings that I have ever seen. Most of the vendors were still there after12:00. The forums were well attended with a few new wrinkles including a morse code contest. The testing minted 4 or 5 new Generals and 1 new Technician. This is one of the few hamfest test sessions I can remember where there were more upgrades than new licensees. Henry and the rest of the Hamarama Committee are to be commended for putting on a great hamfest. The 2013 SET is scheduled for December 14. Everyone in ARES needs to check with your EC or DEC about the details of the test. Let’s have a good showing and find out where our weak spots are. 2014 is the Centennial of the ARRL. There a lot of neat things coming for the year. The first one is the Centennial edition of the ARRL Handbook. You can even get the hardback version embossed with your name and call sign…..(mine’s ordered)…..If you haven’t gotten a yearbook yet, this is the year to do it. As I write this the final edit of the ARRL Centennial Video is complete and will be released in January. This is a very good product available for use at your local club meeting, hamfest and broadcast and cable television outlets. The video is an overview of the ARRL’s first 100 years. I think you will like it. Also in 2014, will be the Centennial Convention at Hartford, Connecticut. If you have never been to headquarters, now is the time to go. There will be lots to do and see, including tours of HQ and W1AW with opportunities to operate W1AW. If you can’t make it to Hartford for the convention, there will be 6 regional Centennial Conventions. Ours will be the West Gulf/Delta Divisions Centennial Convention at Ham-Com in Plano. There will be an ARRL Expo like setup giving you the chance to meet with folks from HQ that keep the day to day things at the ARRL moving. Come to Ham-Com for your piece of the Centennial! Also in June, Field Day! This is a wonderful opportunity to showcase Amateur Radio to the public and use the Centennial as a hook for the media exposure. There will be additional PR materials for your use. The Directors and Section Managers also will have available PowerPoint presentations on the 5 Pillars of the league. These make good programs for your club meetings. There will also be a revised version of PR-101, titled PR-101.2 to be released at Dayton. When it is released, you will be able to view/download the entire program on the league website. Stay tuned for more Centennial stuff!! More to follow as the information becomes available. Again, thanks to all of you that have given me your support during and after the surgery. It is greatly appreciated. This will be the last Section News for 2013, so I would like to say as we all gather around the table, tree and even the rig, let’s all remember the real reason for this great season of togetherness. Wilma and I wish all of you a Merry Christmas and a Happy and prosperous New Year! Does your club have "just because" moments? The Altus group met at the home of Carole (AF5CT) and Dale (N5VX) Town to fellowship around some turkey supplied by Ron, W5MPY and other food provided by a number of folks and their family. Carol, AF5CT (left) looks on as Ron (W5MPY) and Donna (WW5MPY) (in yellow shirts) lay out the food table with Chandra at the Altus amateur radio Thanksgiving event while Johnathan and James wait in the wings. Ron, AF5AS, captured James, AB5FS (left), and Public Information Coordinator Lloyd, KC5FM with the world famous Yagi cat. Does your club have "fellowship" events? Do they always involve food? Share your stories! It seems there was a good turnout, according to David, KC5SII. He reported over 350 amateur radio operators attending. Kevin, N0IRW, and Wilma, manned the ARRL booth. W0BUW was on hand to help customers. in time of need, it's also a lot of fun." that runs various Amateur Radio Talk programming 24/7. Do you recognize any of these faces? Have you started your video yet? There was a good turnout at Texhoma Hamarama this last weekend. As always, your Section American Radio Relay League folks were there. The Section leadership was joined by Division Director Dave Woolweaver, K5RAV and Vice-Director John Robert Stratton, N5AUS were present at the League Forum. Just a few of the vendors in place. Huddled masses wait for the announcement of the winners at the popular drawing. Can you name this radio? N7XYO, left, joins K5RAV, N5AUS, and N0IRW (L-R) at the League Booth.